When a vehicle is stranded, make the rescue with the heavy-duty LEGO® Technic Service Truck with tons of realistic powered functions. Activate the included LEGO Power Functions features to extend the rear outriggers or extend and raise the fully adjustable crane arm into position. Then lower the hook with the working winch, unfold the rear wheel lift and load a vehicle to tow. This awesome 2-in-1 Service Truck also features 8 wheels, all-wheel drive and hydraulic lifting element. It’s just like the real thing! Rebuilds into a truck with a crane that can raise and lower, grabber, outriggers and detachable trailer. Last known price is 116% above the initial Lego retail price! 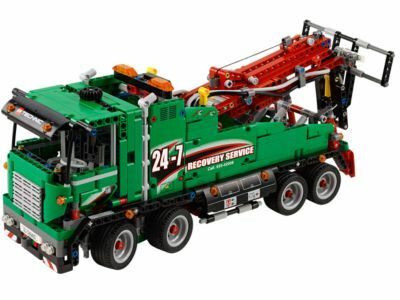 The Service Truck (42008) Lego set is no longer directly available from the sites below. However, 3rd party partners of these sites might still have the set available. Alternate description Build the 2-in-1 LEGO® Technic Service Truck with crane arm, outriggers, wheel lift and winch powered by LEGO® Power Functions motors!